Home > Settings > Coupons > How do I create web store coupons? How do I create web store coupons? If you sell items through the web store, you can incentivize sales by giving your members a web store coupon. The coupon code can by used once by each member and can be redeemed for a dollar amount off the total web store purchase. 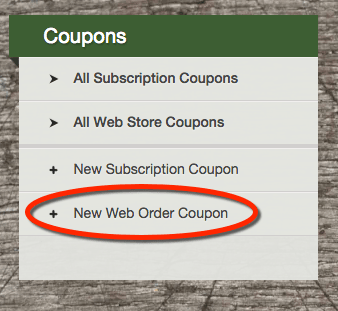 Go to the Settings tab --> Click + New Web Order Coupon. 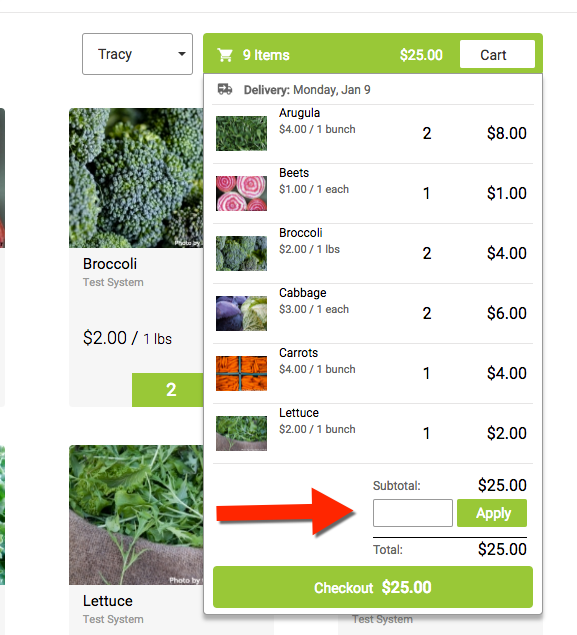 Complete the following fields, select Publish, and save changes; members will then be to apply the coupon to a web store order. 1. Coupon Code - What you enter here will be what the members use as the Coupon Code. $ - Fixed Dollar Amount: The discount amount entered will act as flat dollar amount discount, which will be applied against the total amount owed when checking out from the sign-up process. 3. Applies When - Set the conditions for coupon use. If you leave the fields blank, the coupon will be available for use with no conditions. 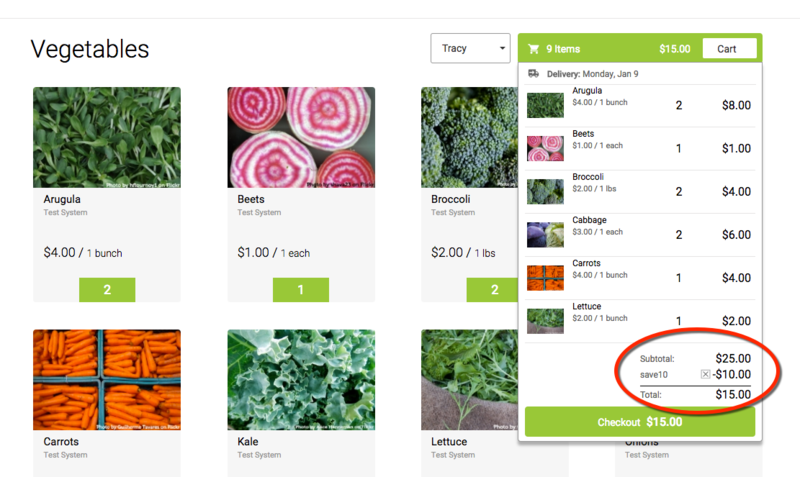 Alternately you can set a minimum order amount, designate the coupon for first time orders only, or both. Published: The coupon code is active and members may enter it during signup. Draft: The coupon code may not be used by members. 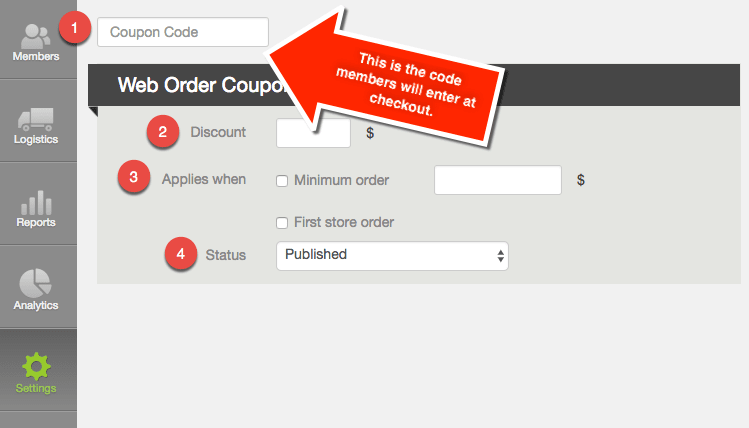 Once one of your coupon codes is published, the coupon code field will appear in the shopping cart. 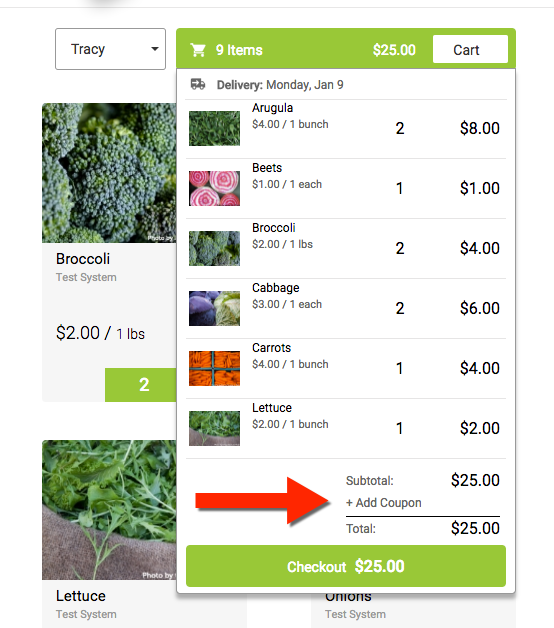 Members may click +Add Coupon, then enter the code in the field that appears. The coupon will apply to the total in the summary, and the member will be charged the discounted amount at checkout. How Do I Track Web Store Coupons? To download a report of the Web Store Coupons Usage, go to Reports --> Accounting --> Web Store Coupons Usage. Set the date range you would like to view usage for and download. The system will generate a csv with the date used, the member, code, and dollar amount off of their purchase.